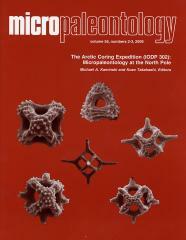 ABSTRACT: The Cenozoic sedimentary record of the central Arctic Ocean recovered during the Arctic Coring Expedition (ACEX) Integrated Ocean Drilling Program (IODP) Expedition 302 contains a new dinoflagellate cyst genus, Arcticacysta, assignable to the Peridiniales. Two different species are here formally described, Arcticacysta backmanii and A. moraniae gen. et sp. nov. Both species have a combination archeopyle, formed by the loss of several plates. In A. backmanii the archeopyle involves three apical (2’-4’) and three intercalary (1a-3a) plates. In A. moraniae the archeopyle is formed by the loss of four apical (1’-4’) and three intercalary (1a-3a) plates. The species differ in size and in the wall structure. A. backmanii has a microreticulate wall and is relatively large, whereas A. moraniae is smaller and with spinose wall. Their lowest occurrence in the ACEX core lies at the base of subunit 1/5 (core M0002A 46X, 113-114 cm, 198.70 meters composite depth, mcd). Morphologically closely related taxa, potentially re/presenting other species of Arcticacysta, have been previously recovered from the late Oligocene and early Miocene sediments of the Norwegian-Greenland Seas.